Right, this slot needs no introduction. You know from the title of the slot what you’re getting yourself in for so lock the doors, grab yourself a cold one and let’s get ready to smash it up! For those of you that are not familiar with Oktoberfest, it is the annual beer festival in Munich that has fast become somewhat of a tourist attraction for men between the ages of 18 and… well… death really. You just drink as much as you can for as long as you can. So it is intriguing that slot developer Cryptologic have decided to release a slot based on this noble event. There are already slots out there that tackle the idea of the beer festival but this is the first that directly approaches the famed Oktoberfest. WMS Gaming’s beer-swilling themed Bierhaus made waves in the slots industry when it was released and Cryptologic have already enjoyed success with the alcohol-fueled Pints and Pounds. It was almost certain that this slot would be an equal success. Slots and beers… what could possibly go wrong?! Oktoberfest is a 5 reel, 9 pay-line slot with a maximum cash jackpot of $125,000 up for grabs. It isn’t a mandatory stipulation that you have to play this game with a beer but it might certainly help during the spins that don’t deliver a win. The symbols in the game consist of a barmaid, a lederhosen wearing beer drinker, beer mugs, bratwurst, beer barrels, pipes, accordions and all things that you would see on your average trip to Oktoberfest. Is That Smiling Horse Drunk or Just Wild?! Bizarrely, the Wild is represented by a smiling horse symbol. This substitutes for a number of symbols but surprisingly not all to complete winning combinations and give you big prizes. In fact, the Wild only substitutes for the barmaid and the beer drinker. 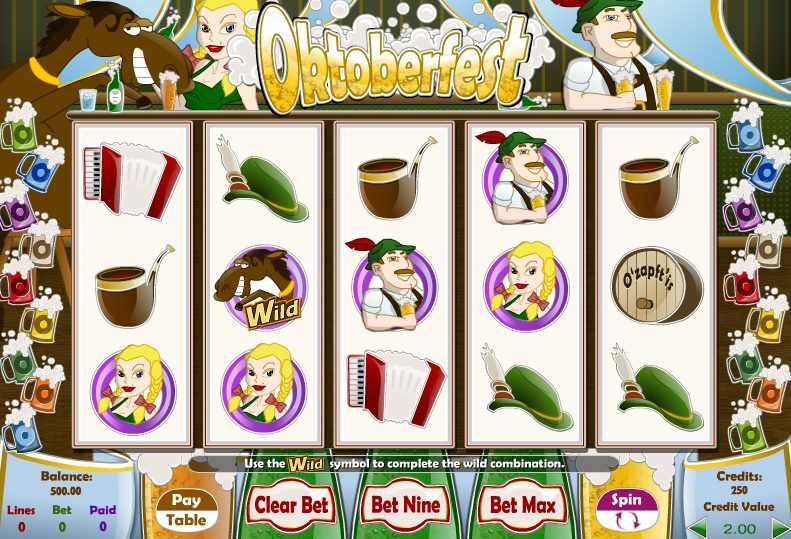 The main bonus feature in Oktoberfest is the Beer Barrel Bonus and this is triggered when one of the three Bonus symbols are hit across the reels. The three Bonus symbols come in the form of the full beer glass, the empty beer glass and the beer bottle. Once triggered, you will be presented with twelve beer barrels that are organized in a pyramid-shaped stack. You must then pick different barrels to reveal prizes. Oktoberfest is not one of the greatest slots ever made but thankfully it acknowledges this and just goes all out to make you smile. From the lederhosen clad beer drinker to the smiling horse Wild, this has everything to make you chuckle and you can win a few coins on the way. If you’re not expecting much from this then you won’t be too disappointed and it could turn out to be your guilty pleasure.